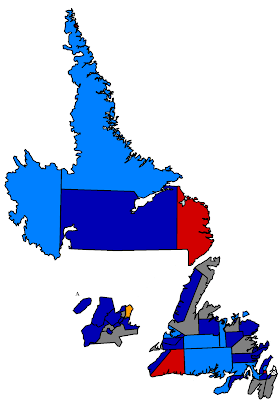 The dark blue districts are those which voted for the same PC MHA in 2003 who is still sitting in the same district today — or the closest-matching in the handful of cases where redistribution had much of an effect. The red and orange colours indicate the same theme for the two opposition parties. The light blue districts are those which the Tories picked up either in by-elections in 2005, 2006, and 2007, or — again adjusted for redistribution — in the last general election. The late Jack Byrne's departure from politics having not been voluntary — or a little less voluntary than that of some others — Cape St. Francis is left blank. Nearly one third of the PC class of 2003 are now out of provincial politics, having been replaced by rising stars Ed Buckingham, John Dinn, Steve Kent, Keith Hutchings, Felix Collins, Darryl Kelly, Kevin Pollard, and Tony Cornect. "Rising star" could also be used to describe some of the new blood which arrived through pick-ups, such as Terry Loder, Jim Baker, Derrick Dalley, Clayton Forsey, Tracey Perry, and Calvin Peach, or the lateral move that resulted in Wade Verge. Yes, that term could be used.